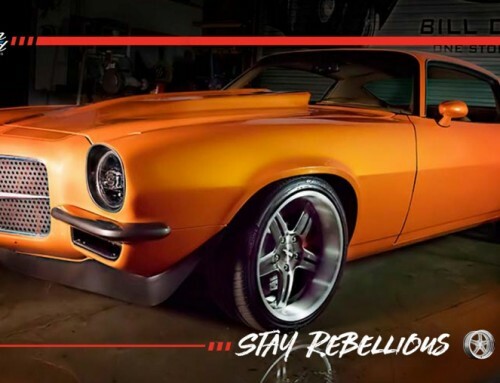 We know you’re tired of that commute to work, day in and day out. That’s why we went and found the world’s best 10 roads that you need in your life right now. 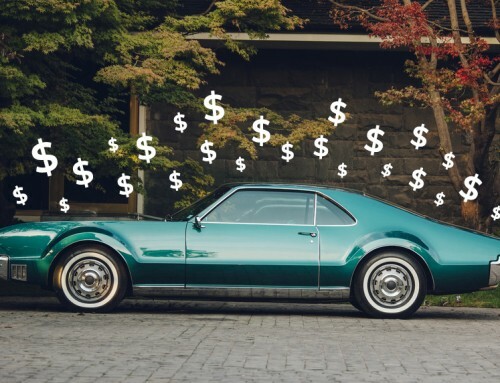 Your car will thank you, and so will your sanity. Buckle your seatbelts, you’re gonna need ‘em. Nestled in the Italian Alps, the Stelvio Pass (in English) is one of the most famous driving roads in Europe, and the world. With an elevation of 2,757 meters above sea level, it is the second highest paved road in the entire Alps mountain range. Many driving enthusiasts have added the Stelvio Pass to their bucket list after Top Gear deemed it to be the “greatest driving road in the world,” and it is easy to see why. It is often ranked as the ultimate test of driver and machine, and with more than 60 hairpin bends charging past the snowy peaks of the Eastern Alps stretching for 15 miles, that’s no exaggeration. 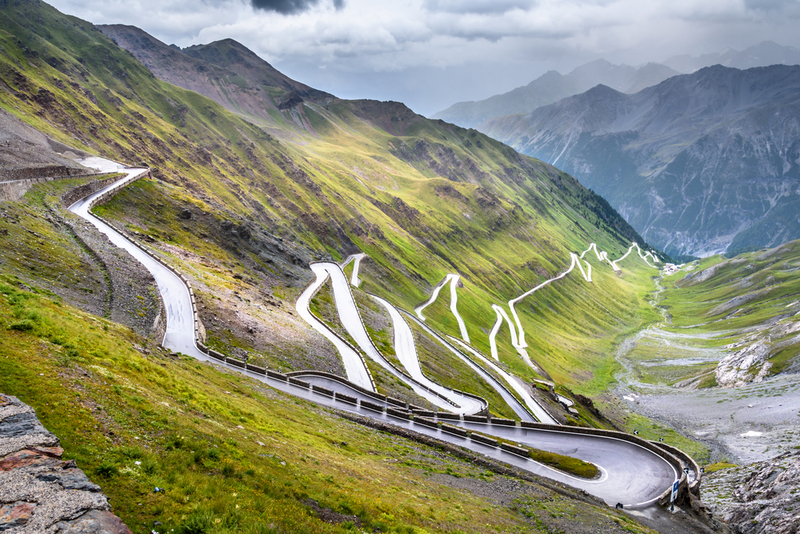 Passo Dello Stelvio (in Italian) offers mesmerizing views as drivers pick their line through bend after bend. The pros recommend this route be approached from the northern end first so that you can enjoy some of Europe’s most dramatic scenery. Though only 30 miles long, this cloud-piercing route is one of Europe’s best. Grossglockner Hochalpenstrasse (we know, we can’t pronounce it either), known as “The High Alpine Road,” winds through the heart of Austria’s Hohe Tauern National Park and provides spectacular views of over 37 different mountains. This adrenaline-pumping journey is definitely not for the faint of heart, lungs, or legs. A quick glance at the map, at its sheer drops, or its 36 serpentine twists, confirms that this drive is no hype. Drivers will start at Bruck in the Salzburg Valley, continuing through the Ferleiten toll entrance where they will soon be treated with stunning, endless views as the road climbs upwards to 8,215 feet. And this route is just as much a nature experience as it is a driving experience. Passengers can gaze out on the frequently changing vistas of lakes, glaciers, pine-clad hills, dramatic, rocky cliff faces, and lush meadows. 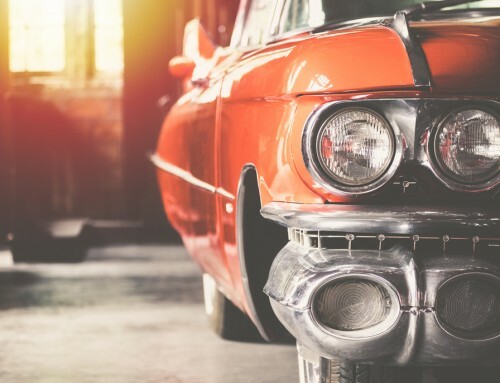 Arguably the most notorious, scenic, and beloved driving route on the West Coast of the United States, California’s Highway 1 beautifully connects San Francisco with Los Angeles and San Diego. Part of a much larger California State Route 1, this iconic stretch known as the Pacific Coast Highway (PCH for short) winds about 200 kilometers and chases the rugged California cliffs and coastlines from Monterey to Morro Bay. This portion of the drive is renowned for its staggering views over perilous cliffs, revealing the Pacific Ocean’s whitecaps as they rush past the dark and ominous rocks below. The drive makes brief contact with old mission towns and iconic beaches. It’s an extremely intense drive because there are no guard rails at the edges and there is little room for error if oncoming traffic swerves in your direction. 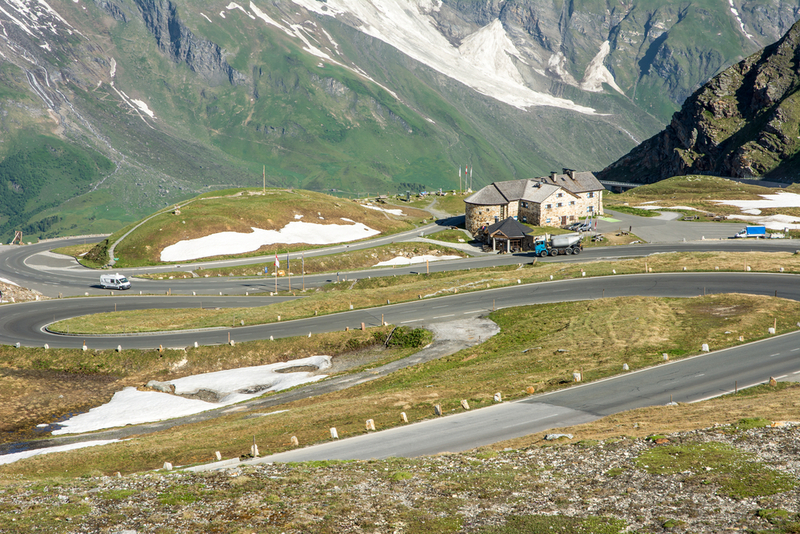 The road often takes hairpin turns with narrow shoulders and steep drop-offs, so drivers must be alert at all times. The pro tip here is to drive from North to South in order to secure the front row seat to the highway’s most dazzling views as well as the easiest access to the many lookout points. Start in Monterey, famous for the historic Cannery Row, and drive south until you reach the pine-tree-fringed beaches of Carmel. Keep driving until you reach the iconic Big Sur, complete with towering redwood groves to your left and wave-pounded beaches to your right. 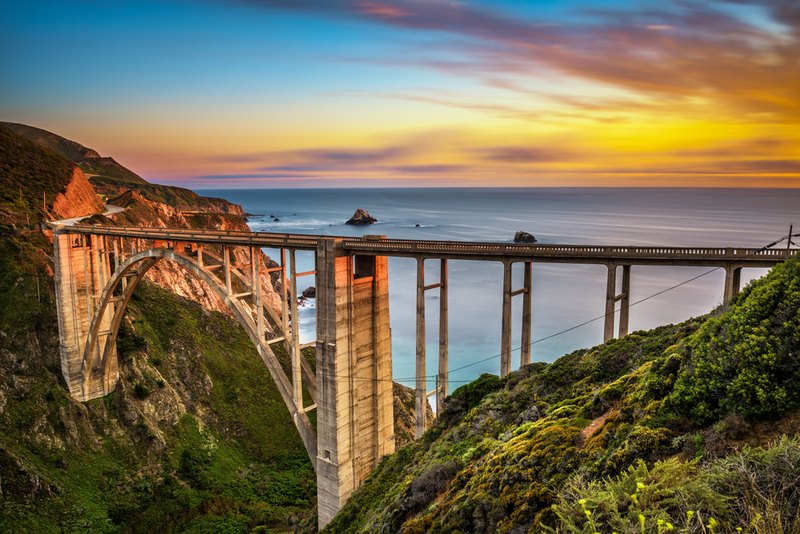 From Big Sir you will cross the famous Bixby Creek Bridge and drive through the majestic Pfeiffer Big Sur State Park and ultimately reach the stark volcanic plug of Morro Rock, signaling you have reached the end of your drive at Morro Bay. Both the Monte Carlo Rally and Tour de France share this awe-inspiring mountain pass in the French Alps. Col de Turini has been featured in three tours and is the stage of the legendary classic car rally in the glamorous French Riviera. But don’t just go there for the celebs and champagne! This route has tested everyone from Stig Blomqvist to Sébastien Loeb, leaving little room for rubbernecking. The road to Col de Turini features a long series of incredibly tight turns that wind up the sides of the mountains and is reached by way of the D 2566 road. Until a few years ago, this route was also driven at night, with thousands of fans watching the “night of the long knives,” as it was called, due to the strong high beam lights cutting through the night. Steep drops appear virtually along the entire route, which reaches its highest point at 1607 meters above sea level. At the top of this narrow, crooked road between magnificent rock faces, drivers emerge out onto a tranquil and undisturbed landscape much different than the dastardly road they arrived on. 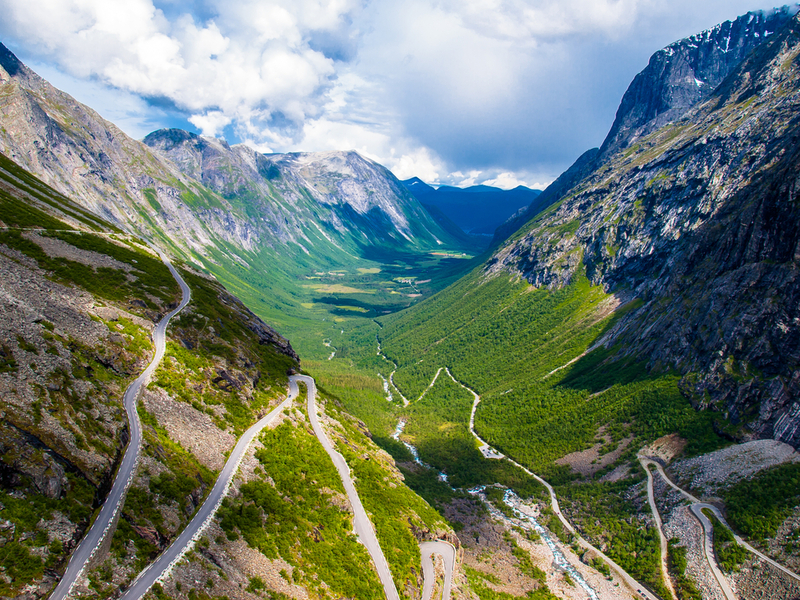 This notorious path, meaning “Trolls’ Path” in English, is a serpentine mountain road in Rauma, Norway, part of Norwegian National Road 63. It became a popular tourist attraction and gained its name due to the steep 10% incline and 11 sharp turns that dogleg the mountain’s contours perfectly. Trollstigen was opened in 1936 by King Haakon VII after 8 years of construction and today remains a spectacular example of the power of engineering in a remote region. The road is one lane each way and very narrow with several tight bends, implementing restrictions for the sizes of vehicles allowed on the road; and although portions of the road widen somewhat significantly, vehicles larger than 12.4 meters in length are prohibited from driving it. Insiders claim the best views to be at the 700-meter (2,300 feet) plateau lookout point, which oversees the remarkable bends and the breathtaking Stigfossen Waterfall. The road is closed during Fall and Winter due to weather conditions, but during the top tourist season, about 2,500 vehicles pass daily. 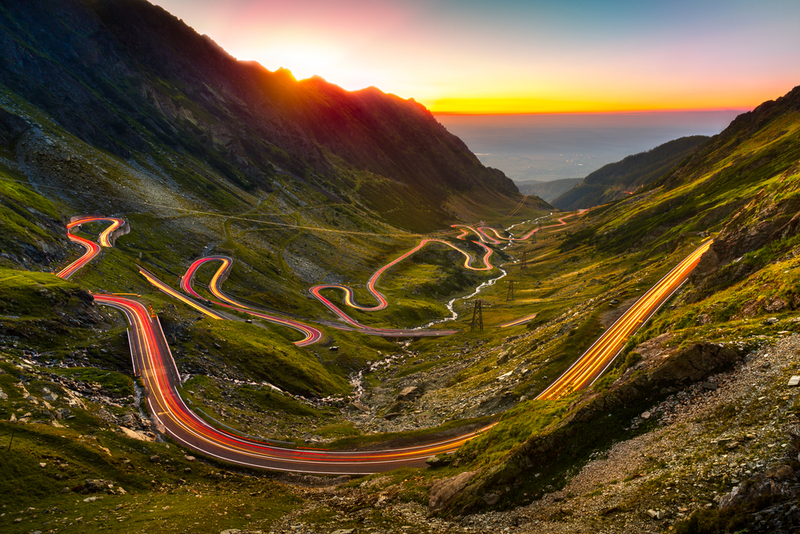 This dynamite-forged highway, built by Nicolae Ceausescu in the 1970s, truly defies the mountains that surround it and holds some of the most spine-tingling views in all of the Carpathian Mountains. The magnificent pathway links Transylvania and Wallachia through a series of tunnels, bridges, and viaducts, and even though the guys at Top Gear raved about this hard-to-pronounce highway, the Romanian gem is thankfully still relatively undisturbed by the motoring masses. The 90-kilometer stretch of road was actually constructed as a strategic military route after the invasion of Czechoslovakia by the former Soviet Union. This allowed military forces to easily be moved within the country with the aim of preventing the Soviets from invading Romania. The road is the second highest paved road in the country, with its highest altitude at 2,034 meters above sea level. But perhaps the most exhilarating part about the Transfăgărășan is the fact that there are countless switchbacks and it curves alongside the silhouette of the mountains almost to a T.
New Zealand’s Milford Road is truly one of the most spectacular experiences you can have on four wheels. Not only is it one of the most scenic roads in all of New Zealand, the Milford Road is one of the most scenic roads in the world…period! 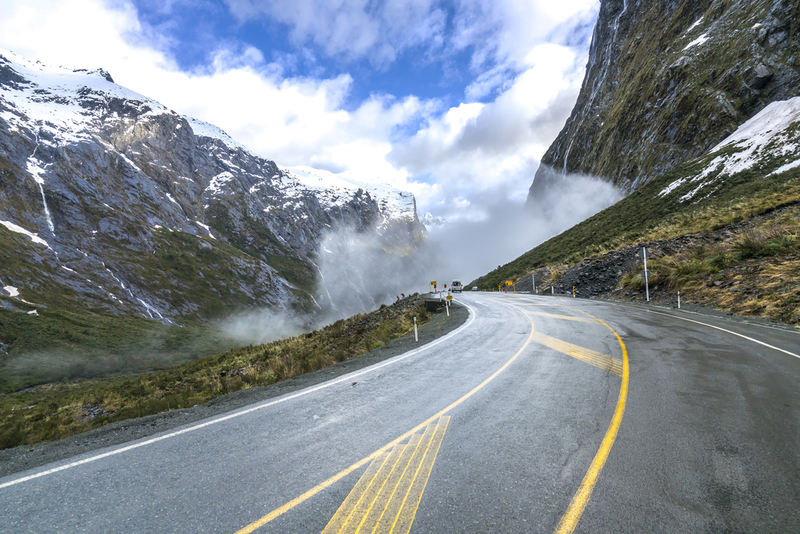 Beginning at Te Anau, this stretch of highway dives deep into the remote Fiordland National Park (where you can catch sight of the renowned Te Wahipounamu World Heritage area) and eventually leads drivers to the heart-stopping Milford Sound. The Homer Tunnel (a single-lane, 1,270-meter tunnel that has quite literally been hacked through the middle of a mountain) signals the adrenaline-pumping descent into the Sound. The windy road is especially dramatic and takes drivers through some of the most extraordinary panoramas known to man, including glacier-carved valleys, the reflective Mirror Lakes, and dense, lush rainforest. Fun Fact: The two-hour drive is incredibly exciting for fans of the Lord of the Rings trilogy, as the route passes by some of the filming locations like Rivendell, the Anduin River, and the Dead Marshes. 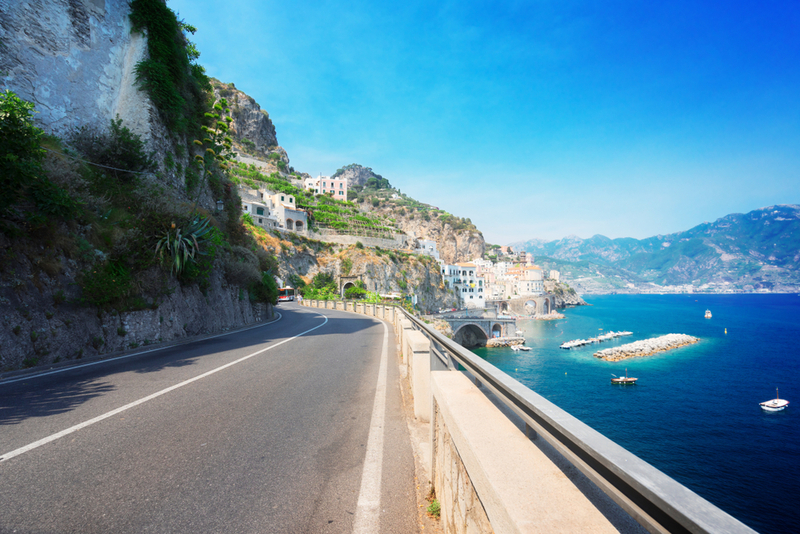 This one’s for the romantics — The Amalfi Coast Road, formally Strada Statale 163, undulates through the sensational Mediterranean landscape, and if you’re lucky enough to be able to rent a vintage Jaguar for the trip, then you’ll be feeling cooler than James Bond. The road glides through the picturesque towns of Sorrento, Positano, and Amalfi, all of which boast a landscape of towering bluffs, pastel-colored villages terraced into hillsides, corniche roads, luxuriant gardens, and expansive views overlooking turquoise waters and green-swathed mountains. 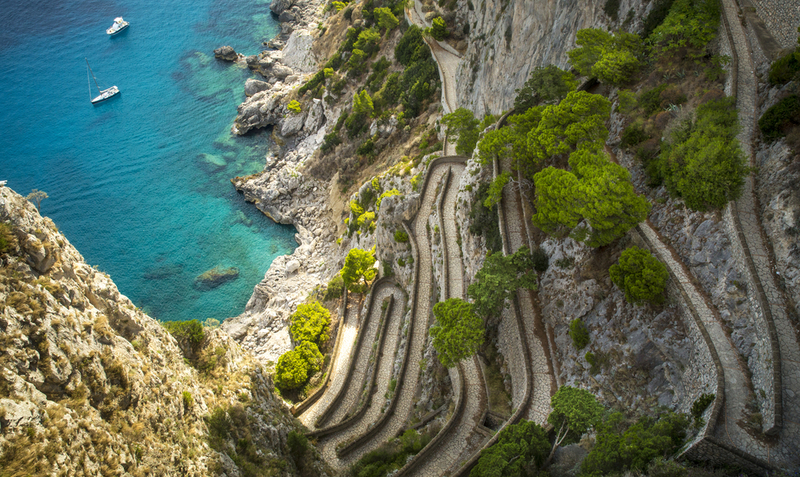 The drive along the Amalfi Coast is famously narrow and challenging. Add in the drop-dead tableau and fearless Italian drivers, known for their behind-the-wheel bravado, and you get one of the most exciting driving experiences in all of Europe, if not the world. Tianmen Mountain Road sure knows how to pack a punch. Located within China’s Tianmen Mountain National Park, Zhangjiajie, in northwestern Hunan Province, this infamous road took 8 years to construct, finishing in 2006. 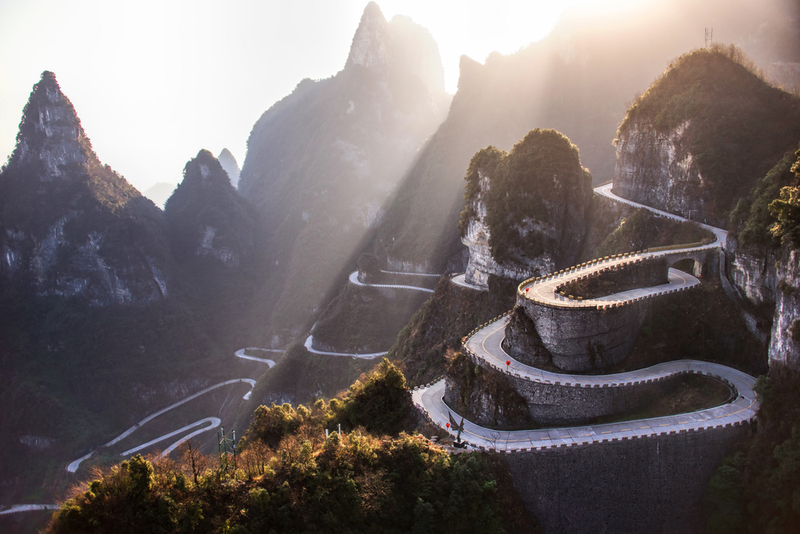 The dizzying freeway furiously snakes its way up the side of Tianmen Mountain, and though it totals just under six miles, it climbs a breathtaking 1,100 meters (3,609 feet) in that short amount of time. The road, which is also called “The Gateway to Heaven” (you’ll see why), features a whopping 99 bends with towering cliffs and deep valleys surrounding both sides. This coiling wonder eventually reaches the top of the mountain and takes its voyagers to Tianmen Cave, a mesmerizing natural rock arch carved into the mountain. Obviously keeping your eyes on the road is the first rule of driving, but it’s pretty difficult in Norway. To call the scenery on this drive picturesque and breathtaking is a giant understatement. Few places in the world can boast a landscape as dramatic and powerful as Norway, and its magic is certainly captured on this road, where wildlife like seals and whales swim in the cerulean Atlantic Ocean waters as you look at the lush green mountains and rocky horizon in the distance. The Atlantic Road opened in 1989 and was honored as Norway’s Construction of the Century in 2005 due to the magnificence and brilliance of the execution. During its first 10 years it was a toll road, but today it’s part of the National Tourist Route and free to drive— over and over and over. 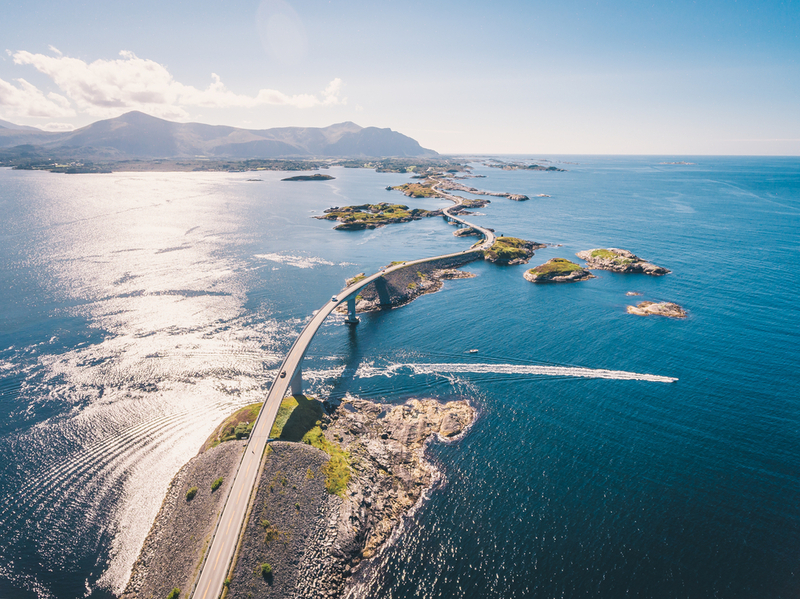 The road is an 8.3-kilometer (5.2 miles) stretch of Country Road 64 (which runs between the towns of Kristiansund and Molde) that connects all the small islands and skerries off the north coast of Norway and the mainland by way of several causeways, viaducts, and bridges. The bridges rise and fall with the islands, making you wonder how in the heck they managed to build it!